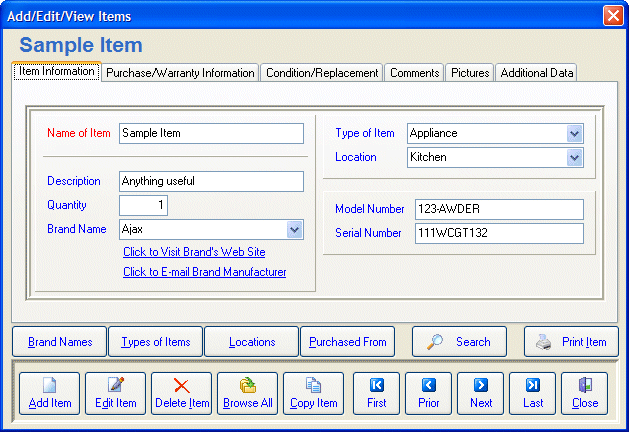 Asset Tracking Software - keep track of all your assets with Everything I Own! What is an asset? The most straightforward synonym for asset is probably "possession". An asset is an often valuable object that is owned by a person or a business - and as such, it is something that you probably want to keep track of. This is where asset tracking software like Everything I Own comes in - it is invaluable for managing your assets for insurance purposes, home inventories and more. Imagine the worst-case scenario. If there was a flood, a fire of if your house or office was burgled - would you really remember every single asset that was lost? Would you be able to recall purchase prices, warranties, brands, models and serial numbers? Probably not. But with the help of asset tracking software, you can make a personal asset inventory list that includes every item you own. And any additional information that you'd like to include. If you ever need any information about your assets, Everything I Own will let you view and print either specific single item reports, or the entire database. This asset tracking software also lets you sort and filter data, both on the screen and in all the reports. And you can save your reports in a variety of formats. Furthermore, Everything I Own contains easy to use backup and restore features which offer complete security and peace of mind. This asset tracking software is also very easy to use - the Quick Start menu ensures that you'll be able to start keeping track of your assets in mere minutes! Keeping track of your assets could save you thousands of dollars. Purchase this affordable software, and ensure that you will be prepared for the worst. Click here to try our free 30 day trial, or better still, buy a fully licenced copy of the software for only $24.95. Everything I Own - the affordable asset tracking software.